Just 19 days after that, Archuleta announced through his website that he is going to the Philippines “to shoot an upcoming primetime series for local network TV5.” He will be joined in the TV show by showbiz greenhorns Jasmine Curtis-Smith (younger sister of Anne Curtis) and Eula Caballero. Let me explain some stuff for non-Filipino readers of this blog. Here in the Philippines, we used to have only two major networks, ABS-CBN and GMA. The past two years, TV5 has emerged as a third-force. Now, we already have three broadcast giants, similar to ABC, CBS, and NBC in the United States. This would be the fourth visit of Archuleta to the Philippines. The first was in May 2009 with David Cook, the second was for a benefit concert for Typhoon Ondoy (Ketsana) victims with Katy Perry, while the third was just last July. As to what (or more accurately, how much) convinced an international music star like him to do a TV series in this Southeast Asian nation will certainly be the subject of speculation for the weeks to come. 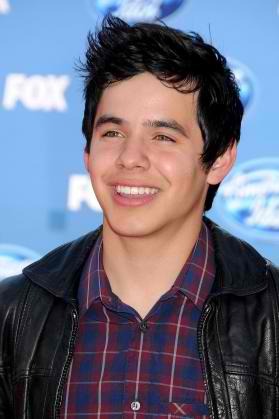 David Archuleta is obviously very excited for his first lengthy acting gig. In his latest Twitter posts, he talks about participating in acting classes. He also uploaded a three-minute video blog, his first this 2012, for his fans in YouTube. In the description, he wrote: “Headed to the Philippines later today! I’ll be arriving this week to start a new adventure in acting. I’m nervous, but also really excited to try this new experience. I’ll be doing a mini-series for TV5 and will be filming in the Philippines for the next few weeks.” He also promised to do another video blog once he arrives to the Philippines. Hope to see him here!